Something's Happening: INGERLAND, INGERLAND, INGERLAND! This was the second most important day in the trip next to visiting my Grandmother (no offense to anyone else that we visited). Declan and I were going to WEMBLEY to see England v. Ghana. For anyone who knows me this was the pinnacle of football for me. 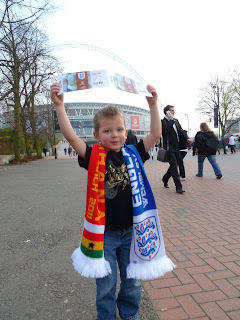 Wembley is the cathedral of international football and I was going there with my son. It gives me goosebumps just thinking about it still. s! It is 5 stories of crack for kids! 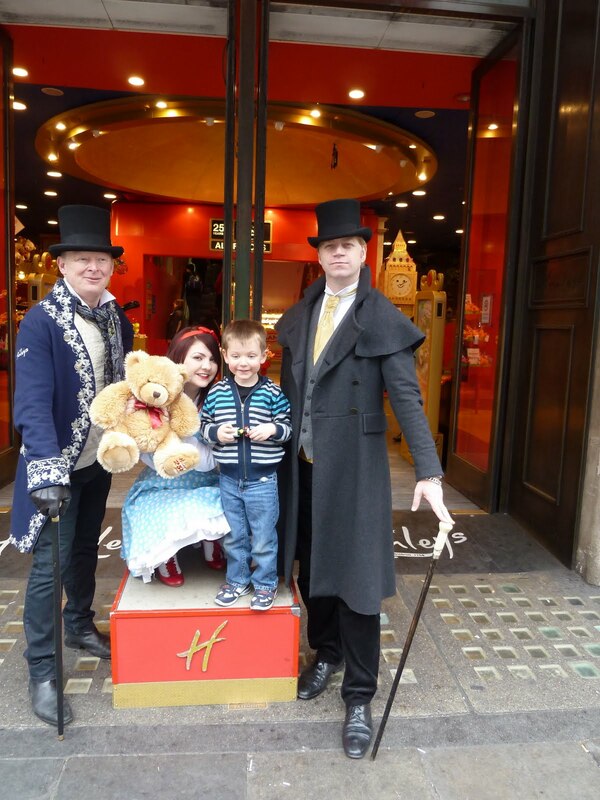 Declan loved it. We spent over an hour in there just looking and playing with stuff. We also decided that this was where Declan would find what to get Rhys. It took about 45 minutes and many different ideas but eventually Declan decided that Rhys would love a train from a show called Chuggington. He was right too! Rhys loves the thing. After all the excitement I was able to convince Declan that we should have nap without much difficulty. It took about 15 minutes to walk to the stadium and we went in to get our tickets. Once they were picked up we went to the shop and looked around for some England gear. Declan was adamant that he did not want a shirt but I was able to get get him a scarf. I was able to get a great England Shirt for next to nothing and they put on the England v. Ghana crest for free! It looks fantastic! We grabbed some grub and waited for the gates to open. We were first in line at our gate. Once in we took 5 escalators up to our seats and had a great view of the pitch. The Ghanaian fans were incredible and though they were a minority you wouldn't know it from the noise they made. Once God Save the Queen beganit was mesmerizing. Goosebumps and tears in the eyes territory. So cool.e at our gate and really excited to get in. Once in we went up 5 escalators and got to our seats. It was so freaking cool to be in Wembley while it was empty. The game itself was great. It was end to end with both sides getting great chances. England's first goal was even scored by a Carroll! How awesome to have a Carroll score the first goal I ever witnessed live at Wembley. We left with about 10 minutes remaining because I wanted to avoid the massive sea of people trying to get to the tube. We made it in no time and the train was pretty empty. We got home by about 10:00pm and hit the sack. It was one of the most fulfilling days we had of together.e was so good and I was so proud of him. We were in a crowd of 90 000 and he didn't even care. He loved it!